In a recent blog post, we focused on US shale production dynamics, and highlighted the impact of continued rig productivity improvements on US shale production. Here we look at OPEC's strategy and risks of potential disruptions in OPEC and non-OECD countries, which could well have a larger impact on global crude supply than US shale. For all the talk about the erosion of OPEC’s market share by growing US shale, the 12 member countries still represent over 39% of global supply (including NGLs), down only marginally from a 42% peak in the last decade. Many market participants and commentators were caught flat-footed when Saudi Arabia decided not to cut production in November, at a time when something like 1mmb/d of capacity needed to be removed. The oil market’s 'central banker' thus sent a clear message to the oil market, which can be summed up as “go balance yourself”. Saudi Arabia's oil minister Al Naimi explained in a December 2014 interview that it was logical for the most efficient producers including Saudi Arabia and Iraq to protect or gain market share against less efficient oil producers, singling out Russia, Brazil and US shale. The prevailing view is that the odds of production cuts target at the next OPEC meeting, scheduled for 5 June 2015, are very low. OPEC is producing 31mmb/d as of March, compared to its theoretical 30mmb/d supply target. This view is borne out by Saudi’s 400mb/d output hike since January 2015, while at the same time Libya and Iraq were also adding output. Financially, Saudi Arabia is unlikely to be in a hurry to cut production as it has amassed large government budget surpluses and just under $700bn of reserves in recent years, and has low sovereign debt. Its foreign reserves are eroding to the tune of c $10bn a month, which would leave the Saudis with at least 5 years' worth of reserves. The recent rise in prices appears to be irking Saudi Arabia, with OPEC's monthly editorial blaming the actions of "speculators" buying front-month crude and storing it. Other less fortunate OPEC producers, specifically those with high budget break-evens such as Iran or Venezuela (see Exhibit 1 below), may well try to persuade Saudi to reduce output, but have little or no leverage over the kingdom. 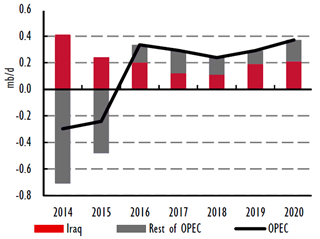 Over the medium term, Iraq looks set to dominate OPEC supply growth with an estimated +1.1mmb/d by 2020 from a 2014 base of 3.34mmb/d (see Exhibit 2). Needless to say, Iraq’s expected supply growth comes with elevated risks, including IS-linked violence, infrastructure constraints, relations between Baghdad, the Kurdistan Regional Government (KRG) and foreign companies, and contract terms. In the nearer term, OPEC and MENA supply is likely to continue to fluctuate mainly due to geopolitical factors, which are by and large unpredictable. Risks to supply are mainly to the downside, with the exception of Iran. Libya’s output has halved to c 0.5mb/d since its unexpected Q314 recovery due to militant attacks. Production remains at under a third of the pre-Arab Spring level of 1.6mmb/d and there is no sign of stabilisation in the country. In Iran, the market was quick to price in incremental exports following a possible nuclear deal by the 30 June deadline. Iran’s crude production (ex-NGLs) has flatlined at 2.8mmb/d since 2012, down from a pre-sanctions level of 3.7mmb/d. However, any ramp-up in exports will probably be gradual as sanctions are lifted step by step and fields returned to production after a lengthy shutdown, with little oil flowing until late 2015 or even H116. Other countries to watch include Yemen, where eight MENA countries including Saudi Arabia are militarily involved. An escalation in Yemen could affect the broader region as well as oil tanker traffic; and Nigeria where Niger Delta disruptions could rise again following presidential elections.